Oregon-resident pianist and teacher George Colligan has had an impressive career as a sideman, most notably with Jack DeJohnette, but has also notched up nearly 30 albums as leader. They aren’t so well-known. (It’s hard to get famous recording mainly for Steeplechase, excellent though that label is). But anyone who caught his stellar contributions to Andrew Bain’s tour of the UK with Jon Irabagon and Mike Janisch late last year will be eager to hear this new offering from Janisch’s Whirlwind records. Colligan produced the recording, and wrote all the music - choosing, he says, pieces he thought would be good vehicles for improvisation. Well, you would, wouldn’t you? The players certainly responded as he hoped. The first track, Whiffle, feels like someone sounded a starting pistol in the studio. The fairly slight head is disposed of at breakneck speed, as if his session mates couldn’t wait to get started on the serious business of elaboration. 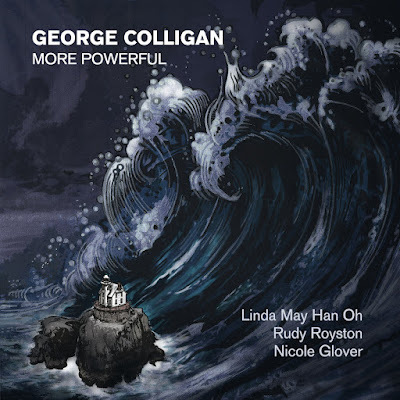 A fast, boppish series of piano statements is followed by a spirited soprano sax excursion from Colligan’s one-time student Nicole Glover and a richly textured drum solo from the matchless Rudy Royston. The other eight pieces are plenty varied, some simply brief lead-ins to blowing like Whiffle, others more impressionistic, or offering a little more structure. Waterfall has a suitably cascading theme for the piano trio alone, with a pastoral reflection from the leader that gathers energy and an extended response from Linda May Han Oh on bass, while Southwestern Silence calms the mood, before the four-way free maelstrom that develops during Empty. The title track, More Powerful than You Can Possibly Imagine, is a Star Wars reference, (though also cues the excellent cover art), and the most urgent performance. Coltrane is the presiding spirit here and Colligan, at his most Tyneresque, delivers a torrential solo that gives way to tenor from Glover, who works up to some unfettered screaming. The latter switches to soprano again for the agreeably skittery closer, The Nash, and delivers her most arresting thoughts of the whole session, especially in a duo episode where she is spurred on by Royston. The whole set will reward anyone with a taste for the range modern-mainstream jazz can cover. It’s a thoughtfully programmed, impressively accomplished affair that should win Colligan plenty of new admirers.